No, no, no… NO! Not again! Why are you you doing this to us, Amos? To yourself? How can you seemingly think so little of our ability… our willingness… to take a chance on something new and untested? Where’s the confidence that should’ve been boosted by recent events which catapulted you to fame and by all rights should be manifesting itself in ever-more daring reaches of creativity? You’re not alone in deserving criticism though, for Aladdin Records is just as complicit, if not more so, for this disturbing lack of foresight during this recent stretch of releases. Why aren’t they rejecting the opportunism of these potential short-term gains capitalizing on recent glory and instead looking to diversify their biggest star’s options going forward? But most of all why does the responsibility fall to us, the record buying public, to have to sniff out such blatant reaches for our money and reject yet another warmed over retread of a previous smash hit? Why are WE the ones who have to forcibly insist on having record companies and their artists deliver something fresh each time out rather than the simply recycling the same old songs with new lyrics? If they aren’t going to uphold certain standards of originality because the record industry thinks so little of our collective intelligence then why should we continue to support them every time they attempt to repackage the same product endlessly in an attempt to fleece us of our hard earned dough? You’re saying that this release actually got REWARDED for breaking our trust? That it hit #1 on the national charts, just the twelfth rock song to have done so to date and that its popularity put even more distance between Amos Milburn and the rest of the rock pack? And you’re saying that in spite of the shallow crassness of the entire affair that the song in question was actually good?!? Possibly even great?!!! Well then, I suppose this just goes to show that in rock ‘n’ roll there truly ARE no rules, no matter how well intended they may be, which can’t be broken after all. The long term viability of any cultural movement probably boils down to one thing over all else – the constant progression of ideas. The archives of pop culture are rife with short-lived fads that to many seemed indestructable at the time but which died quick ignominious deaths as a result of taking that popularity for granted. The fatal flaw in most cases was their creators believing that the original prototype of whatever idea they were in the process of scoring big with had no expiration date. Surely, they reasoned, the next wave of kids that come along will be just as enraptured by Cabbage Patch Dolls, Pokemon cards or hula hoops as their older brothers and sisters were. They never are. They want something new to call their own, not hand me downs they’ve already gotten used to tripping over around the house. In music it’s the same thing. A song’s immediate appeal is largely based on the freshness upon hearing it. An unexpected hook that implants in your brain the first time you hear it. The lyrical twists and turns that you obsessively try and catch, memorize and spit out along with the singer each time you listen. Above all else there’s that indescribable mood a new song puts you in each time you hear it. A feeling that you’ve found a special place that never existed before. But the thing about it is as soon as you discover that place it starts to lose its appeal. The magic and wonder of seeing it, or hearing it rather, for the first time begins to dissipate. The surprises that knocked you for a loop the first time you encountered it quickly become things you now see coming. The heady rush of excitement that met you when you weren’t sure what to expect now becomes a programmable response that is met with diminishing returns. It may be a slow process this gradual decline in enthusiasm but it’s an inevitable one. The only ones who DON’T always recognize this are those who attempt to subvert it for profit, namely record labels and artists. But usually it’s not artists as accomplished and as skilled as Amos Miburn who succumb to this delusion. The fact that this isn’t even Milburn’s first such offense makes his acquiescence to creative malaise all the more troubling. Back in April he’d released Jitterbug Parade which was little more than Chicken Shack Boogie refashioned for a slightly more upscale setting. The melody was the same, the instrumentation and the vocal delivery were as well. Because those components from Chicken Shack, which had recently been the #1 record in all of black America, were so good it still was better than average but its carbon copy blueprint made for a rather uneasy listening experience. 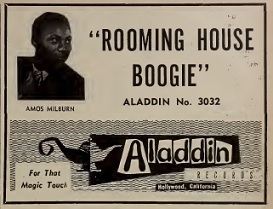 Audiences agreed with that sentiment, rejecting the song in favor of its much more original B-side, Hold Me Baby, a sultry ballad far removed from the Chicken Shack prototype which gave him a #2 hit and showed – or should’ve shown – Aladdin Records that fans craved Amos Milburn the artist, not simply one distinct sounding record from him ad nauseum. They seemed to learn their lesson next time out by issuing another ballad, In The Middle Of The Night, which also hit the Top Three in a long run on the Billboard charts. All of which is to say that Amos Milburn was in absolutely no danger of being discarded because listeners had only been interested in one specific performance. So what on earth were they doing revisiting the same song for a third time in less than a year? The answer is – rather shockingly – they were apparently perfecting the model and giving audiences more of what they craved. Roomin’ House Boogie is about as shameless a ploy as could possibly be conjured up. Even more blatant in fact than Jitterburg Parade which apparently had made the mistake of disguising its connection to its predecessor by having a title that wasn’t instantly reminiscent of the earlier hit. Not so here where we simply go from a Chicken Shack to a Rooming House, a move which is not designed to be a step up, just a small step sideways. The musical portion of this review therefore should be easy enough to present, simply go back and read what we wrote for Chicken Shack Boogie and you’ll get more than a fair approximation of the new song as well. The steamy saxophone lines of Maxwell Davis are all but identical. Maybe he’s playing with the volume turned up ever so slightly, his tone just a touch deeper, but it’s obvious that he was attempting, and largely succeeding, to duplicate his work from the previous year as closely as humanly possible. Milburn does the same on piano, playing with uncanny precision in order to replicate everything you enjoyed when hearing this the first time around. Both of these guys play as well as possible. Their skills aren’t ever in question, just their rather shallow motives. When the first break comes they do alter things a little. For starters it comes twenty seconds later, accounting for an extra lyric that preceded it. Their playing is also louder, more insistent, not quite so laid back in its approach. Whereas “Chicken Shack” was presented more as a sly invite to a party, Rooming House Boogie is more focused on the party itself after everyone has arrived. Milburn’s vocals in this “rendition” offers the biggest change, which is hardly saying much but it’s at least saying something about their methods of adjustment. On “Chicken Shack” he was using almost a semi-spoken tone, sort of a conversational singing style that was unusual but entirely fitting, while here he’s putting slightly more emphasis on the melodic aspects of his delivery. Frankly this helps quite a bit, giving it more of a sing-along quality which for a song that everybody knew inside and out even when they were hearing this particular record for the very first time, makes listening to it more of a communal event. But if the music is the same and the vocal styling is only modestly altered, why didn’t they just reissue Chicken Shack Boogie and not hide their contempt for their audience? Well obviously that wasn’t an option, but the other more excusable reason is this one: while the basic story line itself is the same, the setting and lyrics and specific incidents described within are just different enough to make it stand out. They’re also very colorful, which goes a LONG way towards making Roomin’ House Boogie more palatable, even for those of us who wretch at the very idea of recycling past glories. The similarities in the songs, all three of them in fact, are pretty evident, Milburn is setting the scene for a party in each one. Now never being one to turn down a party invite I can hardly complain but of the three soirees being thrown I have to say in all honesty this one seems to be the liveliest. It’s a house rent party, a common occurrence back in the day when people would throw a bash and by charging a few bucks they’d pay for the booze and the food and hope to have enough left over to make a dent in their monthly rent bill. So the subject is one that everybody buying this record would know firsthand and the details he offers up, from the landlady banging on the wall wanting them to keep it down right down to his certainty that this will get him evicted, are well drawn. One of the best lines is also a familiar one, though it wouldn’t have been in the summer of 1949. Instead it was another piece of irrefutable evidence that the famed 1951 hit Rocket 88 by Jackie Brenston and Ike Turner was put together from used parts left over from 1940’s rock songs, as Amos declares “We’re gonna send down to the corner and get another fifth/And everybody else in the house is gonna take a little nip“. That line, along with the larger theme and framework of Jimmy Liggins Cadillac Boogie, form the entire platform for Brenston’s legendary song, so Milburn gets some additional credit for influence and is taken off the hook slighty for his own recycling efforts, as it shows that artists were always “borrowing” from the past in one form or another. But that doesn’t excuse the act itself, even when the results of this theivery from one’s self is another huge chart topping smash. I can understand the appeal, then and now, to something this endlessly enjoyable. The framework of Chicken Shack Boogie is an enduring one. They had managed to find a melody that was incredibly alluring, an arrangement that was even more addicting and a basic theme that was universally known to their audience and easily adaptable for multiple installments. In fact it’s not that much different than say Big Joe Turner doing the same with a succession of records starting with 1954’s Shake, Rattle & Roll. That and its de facto follow-ups used the same structure and new words, something easily seen when Elvis Presley combined the original and its first follow-up, Flip, Flop & Fly in an impromptu medley on television in 1956. In that case Jesse Stone, the song(s) writer, had originally come up with dozens of lines for the original, editing it down to what worked best. It worked so well, both artistically and commercially, that he went back to the trash can and dug the paper back out and used the discarded lyrics to make another entry, merely changing the tag line. I suppose you could argue that’s what Milburn is doing here on Roomin’ House Boogie, in theory rather than in actuality, and that this is one continuous party over three nights. But we know that’s not the case. But we also know that life doesn’t end with just one party and the activities at most parties are the same – drinking, dancing, loud music and having a ball – and so if the guests themselves have the stamina, why shouldn’t they keep on partying? Okay, we’ll accept that defense. With some reservations perhaps, but if you’re throwing another party like this I have to admit I’d be somewhat offended if I wasn’t invited. Make no mistake about it though I still look down upon the idea of regurgitating the same concept over and over and even am somewhat disappointed in the public in 1949 for not seeing that accepting the same song in new suit was going to have negative repercussions down the road, but when the place is jumping, the booze is flowing, the action is unrelenting and the joy is genuine, well then I for one don’t want to be left out. I may regret it in the morning when the hangover hits, but it will hardly be the first time that’s happened… or the last. 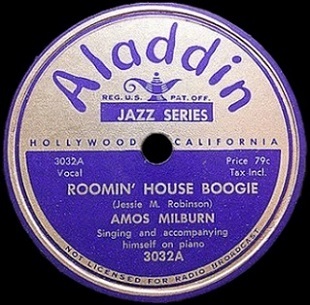 Leave a reply on "Amos Milburn: “Roomin’ House Boogie”"